Letting go a hurtful relationship is not easy. Many people choose not to let go because of this feeling; letting go makes them weak, alone and vulnerable. It is true that no one wants to be in a dark tunnel where darkness crawls up all over their feeling. The burden of uncertainties after the break up is unbearable, especially after damages done in the relationship. No one wants to bare the energy drain from the hurtful dramas. People choose to forget but not forgive (because forgiveness is not easy too). So the next day they hear nothing about dramas. They believe that things are patching up and getting better. They want to believe that they are healing until few days later, or few weeks later, they were caught in the same dramas again, trap in the same arguments again and heartache hold them hostage once more. 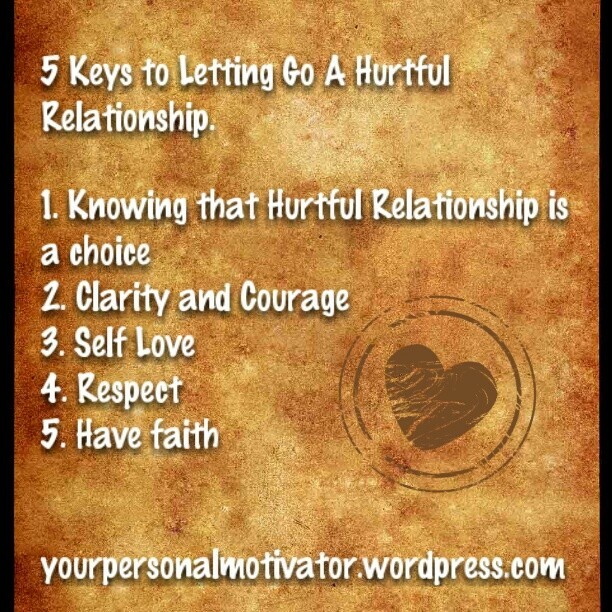 Key #1: Knowing that Hurtful Relationship is a Choice. Pain is inevitable but suffering is a choice. A hurtful relationship like abusive spouse, mentally and emotionally drama queen or king or even a cheater can cause pain to the people in the relationship. No one can avoid the pain. However, accumulation of pain leads to suffering. The fine line between pain and suffering is the choice we make to accumulate the pain or to walk away from the relationship (for relationship that has no hope to heal). Key #2: Clarity and Courage. Once we understand the different between pain and suffering, clarity will open the door for courage to emerge to the surface. Clarity is the power. Courage is hope. To get here, we must first make our choice. The fact is no one can love us until we love our-self unconditionally; which means we love our-self with forgiveness, accept our weaknesses and flaws, self-respect and many more. People tend to ask, doesn’t self love sounds like being an egoistic person? The answer is no. Self love is a love we give towards our-self without judgment. For example; we know that we are facing hurtful relationship. Instead of bashing and cursing our spouses, we accept that we are in the worst relationship at the present moment. We know that, by cursing him/her, we are cursing our-self in return. We know that; by forgiving our-self for being in the hurtful relationship, our strengths (to walk through or walk away from the hurtful relationship) are growing within us. Respect cannot be demand, it can only be earned. That didn’t just apply for others but for self too. If we want to be respected in the relationship; we must first respect our-self enough by not putting our-self in the hurtful relationship repeatedly. What could be worse than staying in hurtful relationship? To see and feel a joyful and happy life is to believe that joy and happiness exist. How can we see and feel joyful and happy life when we are facing hurtful relationship and on-going dramas in the relationship for 247? Remember this; joyful and happy life happens when we are ready to live our lives in a joyful and happy ways. Talk to someone about your problem. Get help today. You can reach me via email. Consultation is now based on donation basis. Many people falsely believe that love means a special relationship with someone. When I grew up, I was conditioned to believe the same. Therefore for nearly 22 years, I believed I have no love with me. Then I found a love. It didn’t last long, we broke up. With the belief I had with me that period, I was back to ‘No Love’ in my life. What happens next? Believing that I have no love, I started to feel desperate to get another love. When I didn’t find one, I switched the love to something else. Luckily I didn’t go for drugs or alcohol. Instead I started to seek love within my career (I believe love is when I work 24/7 for 365 plus plus days with no medical leave…well I failed after 6 months) and non-social life like watching movies or online chat. It worked for many years (well it did help kill my time). Then I realized I felt empty again. I got bored. Then I was back to ‘No Love’ in my life. So what’s actually wrong there? I realized that I was looking for Love in the wrong perspective. Here’s the truth about LOVE. You don’t have to believe me. You can experience it for yourself. Take time to think about it and see the truth out of it. It may take you weeks, months or even years. My objective today is just to get this idea store in your conscious and subconscious mind. When you are ready, it will appear to guide and inspire you. Love didn’t ‘exist’ on the external life, instead love exist from within. Then what exist from within (in the internal) will be reflected on the external. How and why? 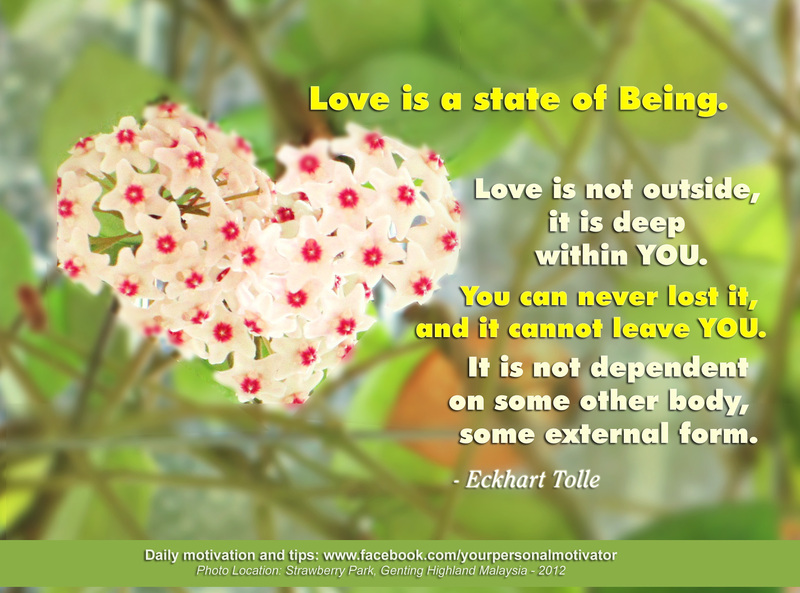 Because Love is within you. What’s within you didn’t leave you. Love always present, only absent in the present of fear, hate, anger. Love is giving. When you realize that Love is within you, what you do or give, you slip LOVE with it. Hence Love is giving. Love is giving that every cell in your body giving love right now. From the cells of eyes to the cells of heart, from the hair to the toes. 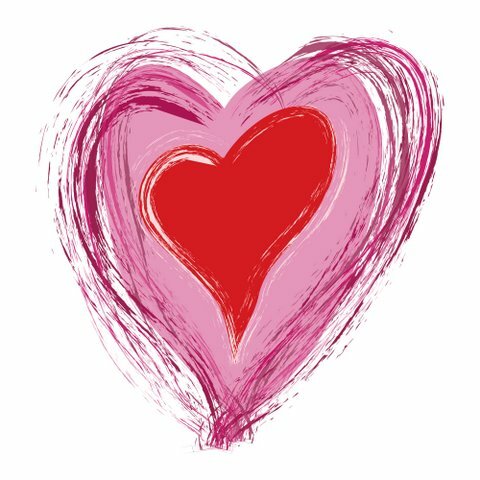 Love is giving and every emotion and thoughts you have will be filled with love. And when Love is giving, every of your relationship (including the special ones) are filled with Love. Sit in silence and feels it; even if this seems odd to you, even if you are feeling hatred right now. Sit and feels it. It’s already within you and it is free for you to feel it. Once you get it, Love appears in every aspect of your life. I already experienced mine and still experiencing it. I hope you do too. Since I accept that Love is from within, I started to see Love shapes everywhere. Originally the flowers were three round shapes. When I shoot a photo, I accidentally got it from the angle that shape like Love. This photo was taken on my birthday last December. I love it. Where the Harmony Relationship Starts? Every situation in our lives is natural, they have no sides. But due to our countless perspectives about life, we tend to label the sides; positive and negative. We then react to it, positively or negatively too. What is given to us (positive or negative) is beyond our control. We attracted it into our lives through our habitual thoughts, painful memories and more. So we have no control of it. Once given, receiving is taking place. Once we receive, we tend to react. What we choose to give back? What we choose to represent our-own-selves in the communication? What we choose to express our own feelings? How we want to express it? How should we respond to it? Think again, it is entirely about how can I do better? And the reaction from us is totally WITHIN OUR CONTROL. It also means to respond to it positively or with negativity is always a choice. Make the right choice or the bad ones have it affects on the relationship. Pick the right ones and the one that has love in it as a response. And it is where the harmony of the relationship starts. The result of every aspect in a relationship does not depend on what we receive from the other person but it depends on what we are given to the other person. The poster is a very good example of the positive respond you can give in your relationship, friendships, family-ships and more. Practice response that has the energy of LOVE and your relationship will be in harmony. Note: *Thank you and the credit goes to the person who designed the poster. Do you remember when was the last time you wish you can be like the person you admired? Do you remember when was the last time you wish you have some kind of unique abilities or creativity? Do you remember when was the last time you say “I accept who I am” especially in the moments of failures? Do you do this to yourself? When it comes to weaknesses, almost everyone wish that they can be different and better. We accept who we are when we score high in life but not when we fail. We pat and cherish ourselves when we achieve success but, do we do the same when we fail? Have you ever pat your own shoulder and say “It’s okay. We do great” when you actually in the moment of failure? We tend to give ourselves self-discrimination when we dealing with failure. I have to say it is a normal reaction that we adapt from the society (cherish the success and boo the failures) but it is not normal to be applied on ourselves. As a human, we always seek equality from others but rarely from ourselves. We desire equal and respect from others but we rarely give the same to ourselves. Try to look back and remember what have we done to ourselves especially when we fail in achieving our dreams? Many of us would criticize own-self. If you always ask yourself these questions, please stop and think this way instead. Failure is not entirely means we are weak. Failure is just another life teacher who is there to teach us the right way to the success. Weaknesses on the other hand are very general in meaning. A person can be weak at expressing emotion but great at expressing mind objectively. If the person choose to work as actor, he would fail but not if he’s the person who solve problems on financial. Hence, I don’t see weaknesses as weak but I see it as imperfection. What’s the different between weaknesses and imperfections? A weakness is the reflection of the imperfection. When we use our imperfections to score in life, we tend to bring weaknesses to the surface. When weaknesses emerge, we claim it as failure. That is why people often see failures as negative. But the truth that failure is nothing but a success guru in life. Imperfection is the balance factor in life. Imperfection is like pieces of puzzles that fit one another. Without imperfection, you and I are the same in everything. When everyone is the same, we do no longer need each other to live and that is not the purpose of life. Every human are made to be with everyone. Perfection means all the space are equally filled and progress no longer need in life. Imperfection, on contrary offers space to growth. As a human, we are made to growth and to progress and we progress better in imperfection. The reason is because our desire to achieve perfection from the imperfection. That force of desire motivates us. What’s the benefit of imperfection? Imperfection allows us to discover ourselves deeper. Going through the challenges and failures will make us know self abilities and talents. Knowing our imperfection can help us build our strengths too. It is alright to be imperfect. We should not feel different from others because everyone has their own imperfection. In marriage and others relationships, imperfection offers opportunity of learning and helping each other. I always remind couples that imperfection is beauty in relationship. Never see imperfection as the gap, instead see it as opportunity to growth together. 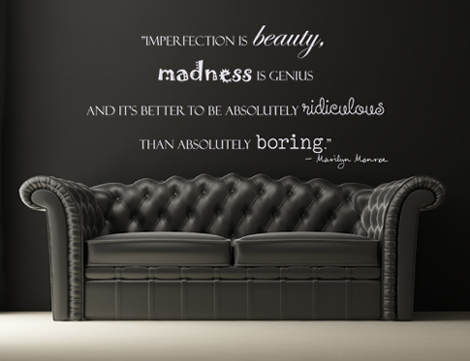 This concept of imperfection applies in life too. I learned a lot from others because my imperfection didn’t give me the knowledge by itself. My imperfection helps me to connect with others as much as my strength connects me with other. When some people use imperfection to achieve their goals, I would suggest you to use your strengths for this matter. Your strengths will help you outgrowth your abilities and talents easier. However, do not leave your imperfection behind. Your imperfections would often offer you spaces to growth especially on new things and new knowledge. In achieving goals, you may use your imperfection to oversee the failures in advance. This method will help you reduce the failure and give more space to success. The song I attached together with this article is dedicated to those who often see themselves as weak and fail to achieve in life. My message is your imperfection is one of the key to your success. Leverage from it. And rise whoever you are because your success is waiting for you! Disclaimer: I do not owned the video and the production of it. Thank you. Forgiveness is part of loving act and yet it is the hardest thing for many people. When we are in between forgiveness and our egos, we tend to choose egos. What happen when we do not forgive? Forgiveness is like cutting the strings that attached us to an unnecessary object. When we didn’t cut the strings, where ever we go, we have to pull the object and its weight with us. The unnecessary weights always slow us down, and soon drained out our energy. Not to mention, along the way, we will add more weights and objects behind us. The heavier it be, the unproductive we became. Forgiveness is not easy. It takes practice to forgive. It takes courage to cut the strings. I always suggest practice forgiveness on small matters. Practice it daily. Here some examples. Always starts with yourself, family and then people around you including your neighbours and people in the office. a) Forgive the madness you can’t take. b) Forgive for the anger you threw today. c) Forgive for the failures you made. The reason is simple; we human are made to express our emotions and make mistakes. So don’t be too hard on ourselves. Forgive ourselves so we could move on and start another new day tomorrow. Forgive ourselves is loving ourselves. a) Forgive your husband for keep forgetting the groceries you ordered. b) Forgive your kids for the mess they made. c) Forgive your in-laws for the nagging. People in the family are the closest people we connected to. It is easier to growth intense connection with our families. Forgiveness will help them and we break the intense chain. Forgiveness is one of the key to a happy family. a) Forgive your staffs for the mistakes they made. In case of frequent delay, instead of bragging about it, find out why they delaying it. b) Forgive your boss about his bossy attitude. Forgiveness helps you move up faster or help you out (from the organization) faster. c) Forgive your colleagues for the gossips they spread. d) Forgive your neighbour for the loud music they played. e) Forgive your neighbour for taking up your parking space. Find solutions to each problem. Forgiving didn’t mean you have to turn your back, walk away and pretend nothing has happened. That’s not forgiving, that’s self-centred. In order to forgive, we must face the situations, the emotions and the solutions. Forgive so we could growth love to ourselves and others. Forgive so others could have chance to spread love to us. Forgive and walk light in our lives.